You are at: Home / Agora / Where has the money withdrawn from Greek banks gone? The evolution of the limit on Emergency Liquidity Assistance (ELA), which is revised by the ECB every week, suggests the ELA funding available for Greek banks increased by 5.6 billion euros in April. This indirectly suggests a similar amount of outflows for this month. However, since the ELA cap is not fully used and details about the available cash ELA buffer have not been disclosed, we cannot have at the moment a clear picture, especially regarding private sector deposits. 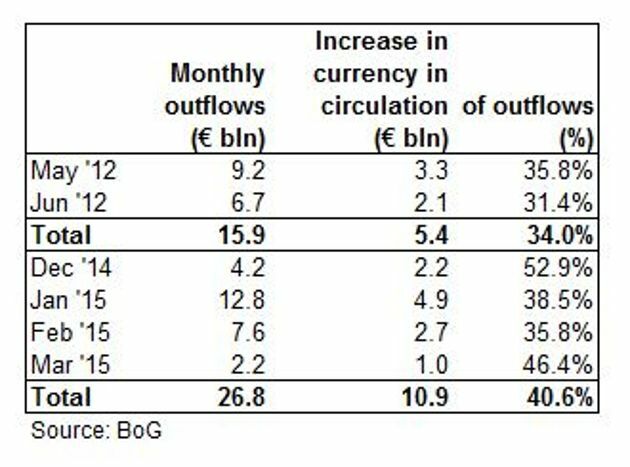 In addition, Greek banks have also recently experienced outflows from the general government entities. 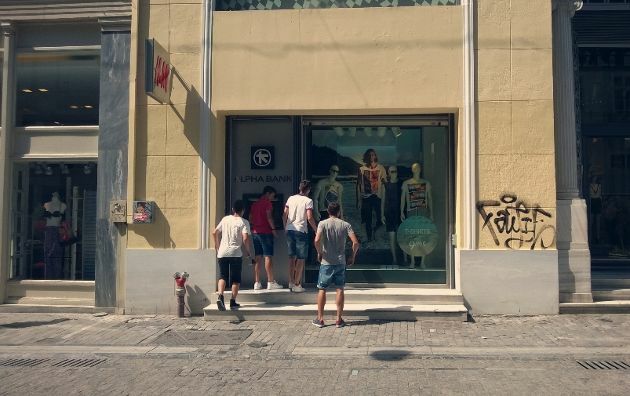 They stood at 1.5 billion euros in March and may have accelerated in April. 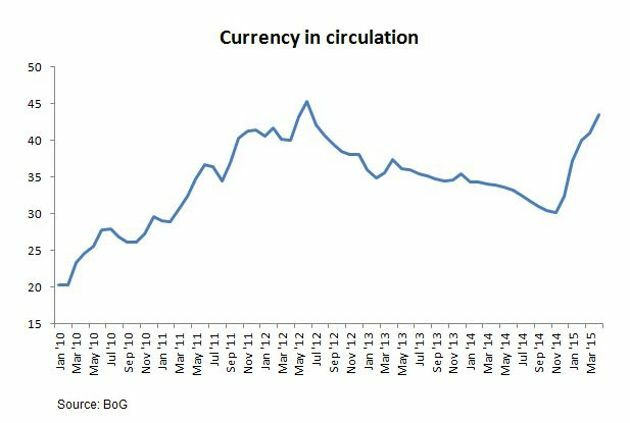 An important element of the withdrawals evident so far is related to the evolution of the currency in circulation, which is provided by the Bank of Greece (BoG) on a monthly basis. The BoG data showed that the currency in circulation – equivalent to M0 – rose from a recent low of 30.1 billion euros at the end of November to 41 billion at the end of March. Banking sources say it rose even more during the course of April. This movement over the 4-month period corresponds to an increase of 10.9 billion euros - or 40.6 percent of outflows. The bulk of this amont relates to cash Greeks have started keeping under mattresses and in bank vaults or safety boxes amid increased fears about the imposition of capital controls or the collapse of talks between the government and lenders. Banking sources note that one-third of total outflows relate to transfers to international money market funds and the remaining one-quarter to money transfers abroad. Before the June 2012 elections, around 60 percent of the huge outflows of that period, which topped 90 billion euros, were sent off shore. The jump in currency in circulation over the past four months is the steepest rise since the beginning of the Greek crisis. January’s figure of 4.9 billion euros is the highest reading over this 5-year period. 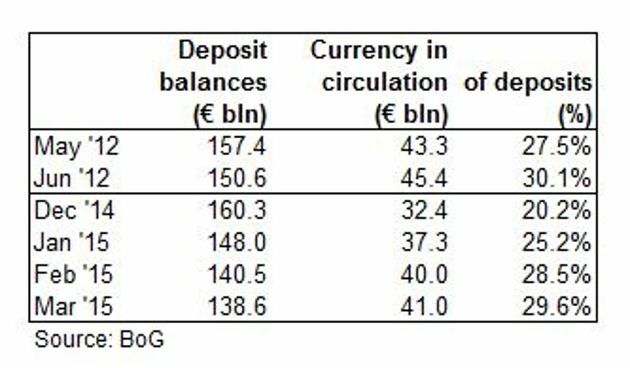 Although in absolute terms, the currency in circulation in March is lower than the peak of 45 billion euros recorded in June 2012, the respective rate relative to outstanding deposits stands at similar levels of around 30 percent. In addition, although the currency in circulation corresponded to 20 percent of private sector deposits in December, it climbed to 30 percent in just three months. The characteristics of recent outflows create hopes that the withdrawals in cash or a cash equivalent will return to the banking system fairly swiftly if an agreement with official creditors is clinched soon, which would also banish fears of capital controls. The sad thing is all the cash held under the bed and vaults could be invested. The only way out of the current situation is investment. Why would any sane investor invest in a country that has lost its sovereignty? If you want to invest in Germany you go to Berlin, not Athens. The only way out for Greece is the overthrow of the German yoke. End of story.